Posted on October 19, 2016 at 9:13 am. As consumers, we are always looking for ways to save money. In the household, the power bill can be one of the largest monthly bills you receive and your HVAC system the largest contributor to it. Here are some tips to save you energy. Make an educated decision when it comes to buying a new HVAC system. Newer ones can be cheaper in the long run when compared to your present system, especially if it is over twenty years old. Be sure to look for the energy star when you purchase a new HVAC system because that is an assurance the item is energy efficient. It could reduce your heating and cooling costs by twenty five to thirty percent. It doesn’t matter if your system is new or old, either way be sure to change the filter every couple of months. This simply makes your HVAC system consume less energy because it runs more efficiently. A dirty filter can cause your system to cycle more which uses more energy. Proper maintenance throughout the year can catch small problems which will help on energy usage. 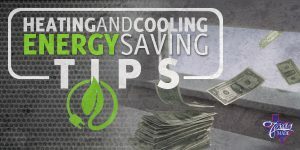 If a HVAC system is not running 100% efficiently, it will consume more energy. Having a licensed HVAC technician perform preventative maintenance at least once a year is a wise thing to do. Last of all, try adjusting your thermostat a couple of degrees, you may not notice the difference as you go about your day, but be assured your bill will notice the difference. Setting your thermostat a couple of degrees up or down, depending on the time of year can have a large impact on how much energy is being used.